Safaricom (NSE: SCOM) has today announced the availability of high-speed internet services in Thika Town, as it moves to progress its country-wide fibre rollout targeting Small and Medium-sized Enterprises (SMEs) in the region. Safaricom Director Enterprise Business Unit, Rita Okuthe engages Mr. Abdul Sheik, Director Soliton Telmec, during the official launch of Safaricom Fiber for Business in Thika. 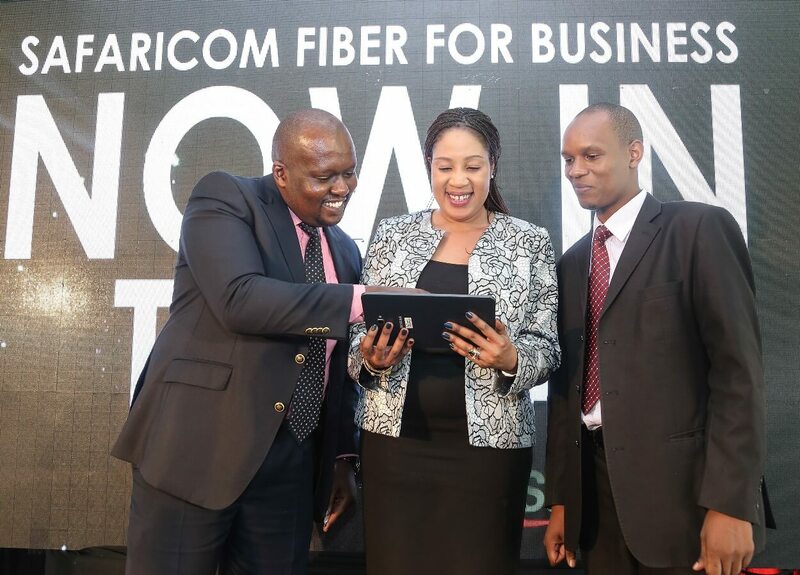 From left: Daniel Gachao, Safaricom Director Enterprise Business Unit, Rita Okuthe, MD All Churches Sacco Isaack Murimi and Safaricom Head of Department Small and Medium Enterprises, Mrs. Agnes Gathaiga during the official launch of Safaricom Fiber for Business in Thika.